Today I received a three-page letter, handwritten in multi-colour, from an old friend. We used to meet up nearly every day, back in those halcyon days when life revolved around playgrounds and daily walks along tree-lined streets. We were part of a close-knit group, the kids all playing together, the moms and the odd dad bonding over a shared sense of humour and the grace to be at the same place and the same space in our lives. I can still picture Di so clearly, striding down the Wortley Village sidewalk, pulling behind her a wagon spilling over with her three kids, a huge grin on her face when she spotted me. She and her family moved out of town shortly before we moved out west, and although we denied it vehemently at the time, we all knew it was the end of an era. They visited us once and we did the same, and there has been the odd phone call, but now contact has settled into the annual Christmas card exchange. I am one of those annoying people who insist on penning a Big Braggy Letter every Christmas, and everyone on my correspondence list with whom I have not otherwise been in regular contact gets one. 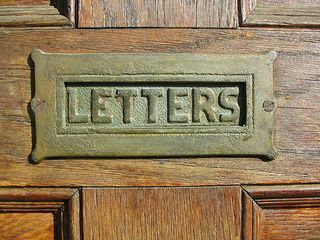 I've heard from numerous friends over the years that they actually appreciate receiving the Big Braggy Letter, so I continue to send them out, even to people who don't sent out cards themselves. Once you are on my Christmas list, the only way to remove yourself is to move and leave no forwarding address, or to die. And today, catching up on my friend's life and that of her kids who now tower over us, I felt intimately connected with her once again. She'd sat down numerous times the past few years, she said, to write back to me, but the writing had always been pushed aside by other demands. I get that. And I have always appreciated receiving her friendly if brief note in her card every year. But to read three pages today, spilling over with eight different ink colours, brought me right back to her kitchen where we would squeeze ourselves and all those kids around the table and laugh the afternoon away. This is why I will always send out Christmas correspondence. I love reading holiday letters. And when I wrote one once I too got a positive reception. I am hoping to send out letters and overdue swag in the coming weeks. It is great that your friend wrote you, letters are the best. Awww. I love Big Braggy Letters. There is nothing like a letter from an old friend. You really know how to up the ante on your letter sending,Missy, if yours include swag. Mine are generally swagless. I actually do too, Lesley. It can be a little perplexing reading the ones where I don't recognize a single name though. It's the finest thing, Mr Anchovy, and for me, epitomizes what the holidays are all about. I love getting long letters in the mail. Although I don't send them as much as I should. There is nothing better than the tangibility of post. 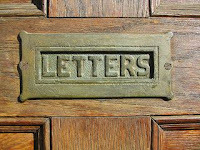 I love e-mail for its immediacy, but it will never replace snail mail for me. I completely agree, Al, there is just something about a handwritten address on an envelope that says somebody cares about me. I love getting them as well, Phlegmmy, even from people I don't know.